There are numerous benefits to be received from Aikido training. For more detailed information, refer to "About Aikido". Aikido is available to anyone with the desire to learn. There are no prerequisites to training in Aikido. How often can a person practice in the dojo? All classes are open to members of the dojo, regardless of rank. Students are encouraged to practice as often as possible. Children 11 years old and younger, however, need permission from the Chief Instructor prior to being allowed to join the general classes. Will I be expected to sign a contract to practice in the dojo? No. The dojo membership covers any and all training days. Once you are a member of the dojo, you can update your membership monthly, quarterly, or longer. Does Aikido have a ranking system? Aikido has a ranking system based on kyu and dan levels. Unlike other martial arts, Aikido does not have colored belts indicating a student's rank. Aikido has two belts, white and black (although children receive colored stripes upon ranking in order to increase their motivation). There are six white belt ranks, from 6th kyu to 1st kyu. After 1st kyu, students test for shodan, or the first black belt rank. As a student advances in rank, said advancement is reflected by placing the student's name slat in the appropriate level on the ranking system located on the dojo wall. The time it will take to become a black belt will vary with each individual. On average, people who train regularly (4 - 6 times per week) achieve black belt in 5 to 6 years. Does Aikido involve weapons training? In general, Aikido involves weapons training. The dojo offers weapons training using the jo (wooden staff), bokken (wooden sword), and tanto (knife). Weapons training involves the performance of katas (forms) and disarming an armed partner. Students are strongly encouraged to incorporate weapons practice as part of their Aikido training. Dojo etiquette is the way one should behave in a dojo. Etiquette ranges from bowing onto the mat, bowing to instructors and training partners to practicing common courtesy towards others in the dojo. Proper observance of etiquette is as much a part of training as learning techniques. All students receive dojo etiquette information as part of their introduction to the dojo. What equipment do I need for class? A gi or practice uniform is required to train. Gis may be purchased at the dojo. T-shirts worn under gis are recommended for women. Any t-shirts worn should be of a solid color and free of prints. Although the dojo has weapons that can be borrowed on a limited basis, it is recommended that students who are interested in taking weapons classes purchase their own weapons. How can Aikido be effective without emphasizing strength? Aikido techniques are not designed to clash with the oncoming attack. 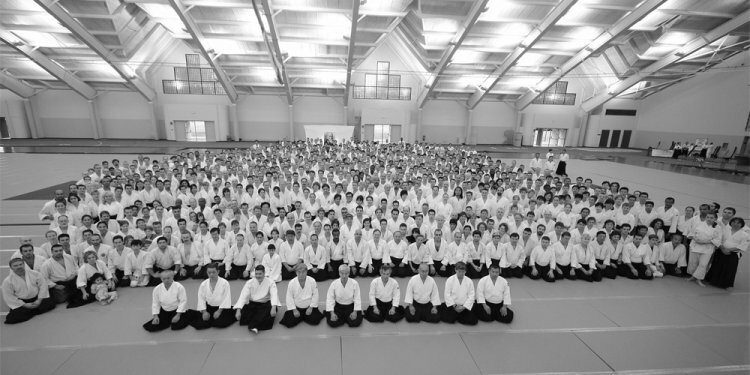 Although one becomes stronger through Aikido training, pure strength along isn't emphasized in executing the techniques as much as using proper technique. No, the nature of Aikido training is non-competitive. There is no emphasis on winning/losing. O'Sensei intended that Aikido training be used for self-development and not in defeating others. Will Aikido help me overcome my fear of falling?